Chikungunya is a virus that spread by the same kinds of mosquitoes that spread dengue and Zika virus. Rarely, it can spread from mother to newborn around the time of birth. It may also possibly spread through infected blood. 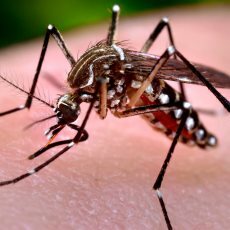 There have been outbreaks of chikungunya virus in Africa, Asia, Europe, the Indian and Pacific Oceans, the Caribbean, and Central and South America. Most people who are infected will have symptoms, which can be severe. They usually start 3-7 days after being bitten by an infected mosquito. The most common symptoms are fever and joint pain. Other symptoms may include headache, muscle pain, joint swelling, and rash. Most people feel better within a week. In some cases, however, the joint pain may last for months. People at risk for more severe disease include newborns, older adults, and people with diseases such as high blood pressure, diabetes, or heart disease. A blood test can show whether you have chikungunya virus. There are no vaccines or medicines to treat it. Drinking lots of fluids, resting, and taking non-aspirin pain relievers might help. Article: Beyond Fever and Pain: Diagnostic Methods for Chikungunya Virus.